After the Tour of Austria, I attacked my intervals in training. My power continued to increase giving me confidence ahead of the next block of racing which began with San Sebastian. The enthusiastic Basque fans rally to create one of the best racing environments in the world. We rolled out under the sunshine. Seven riders escaped and I had opportunity to visit with friends who I hadn’t raced with for a long time. As the pace increased and whittled down the peloton, I felt surprisingly good, like I was sweating less, and suffering less than those around me. After five hours Tom and Louis both said they weren’t feeling 100% so between climbs I followed attacks. A group of ten riders split away. I surged across to them. Four of us attacked over the top got out of sight of the peloton. Then I saw Igor coming across to us with three riders. When he latched onto our group I pulled hard, but eventually the peloton reeled us in. We were fifteen km from the final climb and 25 km from the finish. I followed every attack making sure we were represented in the moves. Roundabouts leading to the narrow road up the last climb made positioning important and it was my responsibility to place our guys in the right spot. I was in third position and pulled out of line to look for my teammates. The fight for position began and a team surged up on my right. When I looked back the first rider on my right shifted to the left bumping my handlebars with the back of his leg then overlapping my wheel. In the blink of any eye I was sliding on my back, looking up at the charging peloton and praying. Dominoes. Bikes and bodies slammed into me and I found myself under a pile. I stood slowly and felt that nothing was broken. Immediately I felt immense guilt for causing a crash that affected so many. I got back on my bike after making sure that not too much of my bloody rump was showing out of my torn shorts. I reached back to adjust my broken helmet and my hand returned with blood on it. After the race it was clear that a chain ring had cut into the back of my helmet and two teeth had reached my head, meaning that somebody rode over my head. A few inches lower and it would have cut my neck. I made it to the finish with a few who had been involved in a later crash. Igor had placed 14th. The first thing I did before showering was to call my wife to let her know I was ok. She prepared me for what I would see on social media. Every insult imaginable had been directed at me for initiating the crash. Landa, Bernal, and Latour had been seriously injured. Broken jaw, broken vertebra, and ribs. Their fans were upset. I was upset. Those guys are young cycling legends and super humans off the bike. My heart sank. Crashes like this happen in every race, but rarely with such grave consequences or directly in front of the television cameras. I’ve never been a huge risk taker in races preferring to spend a little extra energy than make enemies, but I made a mistake at great cost. I apologised. All will recover, and many fellow professionals, friends, and fans reached out to help me process the difficult situation. I will continue to pray for those guys during their recovery and keep racing with heart. Last year I was in the breakaway 4 out of 5 stages earning victory in the sprint competition. I took courage from the strength I felt in San Sebastian, but the stress and shock that the crash put on my body required time to dissolve. With just 4 world tour teams in the race there is less control and the race can kick off at any moment. The first half of the stage was mellow. Then on a small hill with 30 km to go Astana launched an obviously premeditated assault. I followed their attack which momentarily shattered the peloton, but Sky took over control neutralising the situation. The peloton split over the next steep climb. 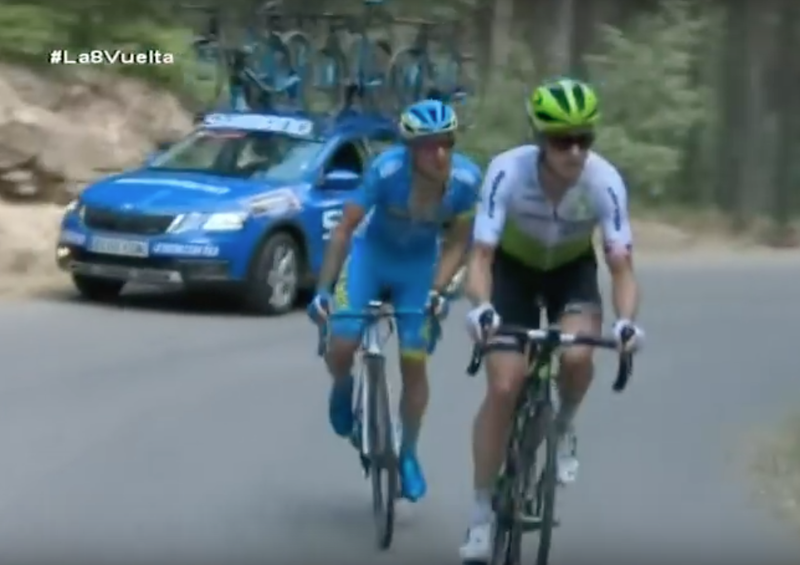 I strove to assist our climbers positioning for the steep final 1 km, but the effort I’d already spent covering Astana’s attack cost me. Merhawi opened his sprint too early but placed top 10 and Louis, Igor, and Amanual were just 12 seconds off the pace. A standard sprint stage with a minor threat of wind meant a controlled but occasionally stressful race. My legs felt heavy as though I’d been in a breakaway the day before, but Johann and I helped lead the team through the stage. In the finish I put myself in good position to sprint, but it turned dangerous. At 1.5 km to go I had a guy trying to pass in the dirt off the road on my right pushing my hip and another rider on my left leaning into my shoulder trying to squeeze ahead of me. I shoved them off but feared fighting with guys willing to take that much risk and finished 20th. El Picon Blanco rises at 9% for 7 km. Two tight turns at the base made positioning important. Those turns were my finish line. I worked hard to make sure Moviestar, Sky, and Astana weren’t in the breakaway which finally slipped away at the top of the first climb. We settled into a quick pace. 4 km before the last climb I brought our climbers to the front and drag raced other teams to those turns. We entered the climb first and I swung off. Igor and Merhawi finished 4th and 5th with Louis just behind in 13th. We now lead the team classification and sit 3rd, 5th, and 9th overall. I kept an eye on the world tour teams at the start until five riders slipped away. Moviestar chased and it was easy behind them. I noted the beautiful day to one rider. “Boring,” he said. But, I enjoyed getting to appreciate our surroundings, amused by things like a very Spanish man in a small town holding a donkey on a leash, and huge vultures camouflaged on their perches in the red cliffs. An easy bulk of the stage guaranteed a hectic finish. It was hard to stay in one line but I helped lead our boys through the critical turn 2 km to go where the road kicked up and into the final km. A crash behind me disrupted a few riders including Igor. Merhawi placed 5th and Louis held onto the first group. I gave Igor a hand sling but he lost a few seconds. In the end the jury decided to give everyone the same time because of the crash so we maintained our overall positions. There hadn’t been much fight for the breakaways until now so we expected one on the final mountain stage. Our directors assigned Amanuel and I to the breakaway in order to make it further up the final climb where we could support our GC riders. Sky caused havoc. On the first climb Amanuel made it into a group of 16. Astana chased that group back to 15 second on the next uphill. Their leader, Lopez, sprinted across the gap. I turned myself inside out to hold his wheel so I didn’t open a gap for the guys behind me. After 20 km the race opened again. I jumped with as much as I could. Having spent so much already I committed myself to make it in the breakaway. After 60 km I followed a Moviestar rider. We got a gap and I drilled it. Nine more riders came across to us. The peloton kept us between 1 and 2 minutes until the final climb. Rosa from Team Sky told me, “at the bottom after the climb we go.” I stuck on his wheel when he launched the attack. I pulled through with force to the top of the first steep pitch. Angel Madrazo followed and the two of us pulled away from the rest of the breakaway. I didn’t want Madrazo to know I was suffering so I matched his pulls until a more gradual portion of the climb where I could draft. With 4 km to go we had 40 seconds over the peloton. That’s when Bingen said over the radio, “Ben, Igor is coming. Stop immediately.” I pulled over to wait for Igor. Amanuel lead the charge and passed Igor off to me. I gave Igor everything I had and left him on the steepest part of the climb with 3 km to go. An organised chase from behind eventually foiled Igors attempt, but it was a brave move. When I watched cycling as a child, I always thought it was the coolest most selfless move when a rider from the breakaway sat up to wait for his leader and then yank him up the road. It also feels cool to be the guy putting his biggest efforts towards a greater cause. Igor placed 5th, Louis 10th, and Merhawi 13th. Respectively they were 4th, 9th, and 7th overall.